Hinshaw, Joshua, age 29, born in Indiana; farmer; $4000 real estate; $1000 personal property. Hinshaw, Elmina, age 25, born in "Ten" [unclear]; keeping house. Hinshaw, Almedia, age 1, born in Iowa. Hinshaw, Joshua, age 39, born in Indiana; father born in North Carolina; mother born in Indiana; farmer. 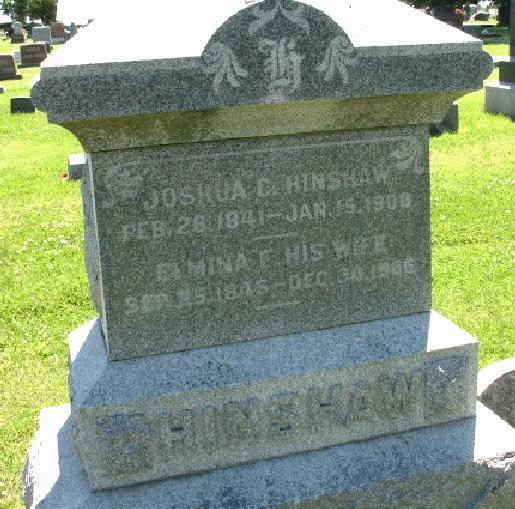 Hinshaw, Elmina F., wife, age 34, born in Tennessee; parents born in Tennessee; keeping house. Hinshaw, Almeda J., daughter, age 10, born in Iowa; father born in Indiana; mother born in Tennessee. Hinshaw, Vivian N., daughter, age 6, born in Iowa; father born in Indiana; mother born in Tennessee. Dawson, William, age 65, born in Ohio; parents born in Pennsylvania; farming. Dawson, Margary, wife, age 65, born in Ohio; parents born in Virginia; keeping house. Dawson, Charles, son, age 28, born in Illinois; parents born in Ohio; single; works on farm. Stine, Nina, niece, age 14, born in Iowa; father born in Iowa; mother born in Illinois. 1870 census, Indianola, Washington Township, Warren County, Iowa; page 470, line #33, dwelling #135, family #140. 1880 census, Washington Township, Warren County, Iowa; roll T9-0368, ED 231, page 355D, line #33, dwelling #71, family #75. 1850 census, Monroe Township, Morgan County, Indiana; roll 162, page 123; dwelling #406. 1870 census, Indianola, Washington Township, Warren County, Iowa; page 470, line #28, dwelling #134, family #139. 1880 census, Washington Township, Warren County, Iowa; roll T9-0368, ED 231, page 355D, line #41, dwelling #72, family #76.